This is pretty obvious for people like me but you just can’t take for granted the value of consistent practice as a musician. As an instrumentalist, I would always like to build up my chops. By doing so, it takes me one step towards realizing musical ideas in a more tangible manner. I was reminded of the value of practice when I was watching an episode of Matt Groening’s Futurama. 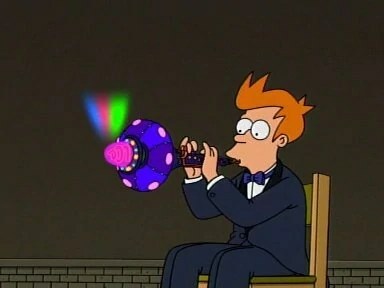 This particular episode featured Fry in his attempt to become a performer and composer. He was trying to learn an instrument called a Holophoner (a sort of clarinet that also produces holographic images). He sucked at it and so he made a deal with the Robot Devil which involved exchanging his human hands for the Robot Devil’s hands. It was an amusing episode with plot devices similar to every work of art involving a deal with the devil and redemption. With all the humor aside, what struck a chord in me in that Futurama episode was the fact that Fry said, “There’s so much music in my head but my stupid hands can’t keep up.” Well, I could relate to that very well. As a composer, I want to accurately express what’s in my head using my hands playing my instruments. It is very frustrating when you find yourself being unable to do that. Should I go on a bargain with the Devil for that? Of course not. Whatever is acquired without hard work often fades away fast. Becoming a virtuoso doesn’t happen overnight, and that’s why practice is very important. Consistent practice is the only way any musician can take their chops to the next level. As an example, all of the musicians in Dream Theater wouldn’t be the virtuosos that they are if they didn’t practice. Unlike stories people typically hear of rock stars, these guys have practice rooms with instruments and metronomes backstage. Their bassist, John Myung, is an excellent model of commitment to practicing. He warms down by playing bass before a show and then cools down by playing bass again after a show. That’s the reason why he can shred like John Petrucci and keep time like Mike Portnoy. So is the point of practicing just for building chops and be able to perform face-melting wankery? Of course not. It’s just a means to an end. Imagine how it could be easier to be able to write and record music if you could play in an instant what’s been ringing inside your head. As a composer, achieving such is a dream come true. Nothing could be more satisfying as a composer and musician than hearing your ideas come to life as you hear it in your head. Whether you want to build your chops on the piano or guitar or you want to build your compositional skills, practice will always get you closer to becoming the best that you can be. That is the value of consistent practice as a musician. Now, please excuse me while I get back to practicing piano, guitar, etc.